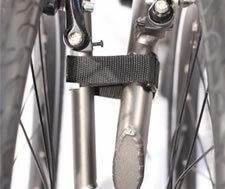 Depending on your model, one or two Velcro binding straps may be included with your folding bicycle. These straps are designed to secure your bike in the folded position. One strap can be used to secure the folded handlebars to the bicycle frame. If your model does not include a mechanical locking mechanism for the frame, another strap can be used to bind the two halves of the bike when folded. 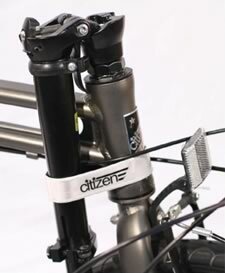 If you'd like to carry the bicycle in the folded position outside of the carrying case, you can use the provided Velcro straps to secure the bike in the folded position.